At the end of the 1800s, when Oberlin graduate Ida May Pope accepted a teaching job at Kawaiaha'o Seminary, a boarding school for girls, she couldn't have imagined it would become a lifelong career of service to Hawaiian women, or that she would become closely involved in the political turmoil soon to sweep over the Kingdom of Hawai'i. Light in the Queen's Garden offers for the first time a day-by-day accounting of the events surrounding the coup d' tat as seen through the eyes of Pope's young students. Author Sandra Bonura uses recently discovered primary sources to help enliven the historical account of the 1893 Hawaiian Revolution that happened literally outside the school's windows. Queen Lili'uokalani's adopted daughter's long-lost oral history recording; many of Pope's teaching contemporaries' unpublished diaries, letters, and scrapbooks; and rare photographs tell a story that has never been told before. 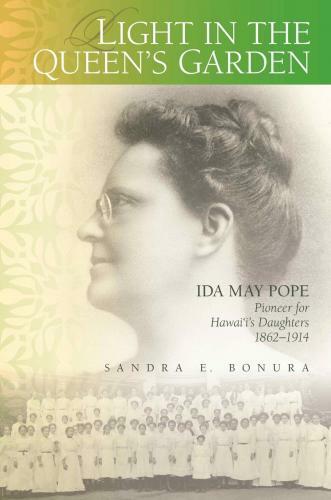 Towering royal personages in Hawai'i's history--King Kalākaua, Queen Lili'uokalani, and Princess Ka'iulani--appear in the book, as Ida Pope sheltered Hawai'i's daughters through the frightening and turbulent end of their sovereign nation. Pope was present during the life celebrations of the king, and then his sad death rituals. She traveled with Lili'uokalani on her controversial trip to Kalaupapa to visit Mother Marianne Cope and afflicted pupils. In 1894, with the endorsement of Lili'uokalani and Charles Bishop, Pope helped to establish the Kamehameha School for Girls, funded by the estate of Princess Pauahi Bishop, and became its first principal. Inspired by John Dewey and others, she shaped and reshaped Kamehameha's curriculum through a process of conflict and compromise. Fired up by the era's doctrine of social and vocational relevance, she adapted the curriculum to prepare her students for entry into meaningful careers. Lili'uokalani's daughter, Lydia Aholo, was placed in the school and Pope played a significant role in mothering and shaping her future, especially during the years the queen was fighting to restore her kingdom. As Hawai'i moved into the twentieth century under a new flag, Pope tenaciously confronted the effects of industrialization and the growing concentration of outside economic power, working tirelessly to attain social reforms to give Hawaiian women their rightful place in society. Sandra E. Bonura lives in Southern California and teaches in higher education. Her two previously published works emanating from primary sources were An American Girl in the Hawaiian Islands: The Letters of Carrie Prudence Winter (1890-1893) (2012) and "Lydia K. Aholo--Her Story, Recovering the Lost Voice," from volume 47 of The Hawaiian Journal of History (2013).